2012 was a good year to own a supermarket. Foodstuffs, the name behind New World and Pak'nSave, reported revenue of an eye-watering $8.33 billion. Rival Progressive Enterprises, owner of the Countdown chain, saw sales rise to an equally eye-watering $5.5 billion. Revenue for the duo rose by 3 percent despite food-price inflation drifting below 1 percent for much of the period. Their secret to success? Market power. With the supermarket trade carved up between them, the two big chains are in a cosy position. Even when economic times are tough, they can use their buying heft to keep down supply costs and reap the rewards in their bottom line. It's win-win for the supermarkets but not necessarily for suppliers or consumers. New Zealand's supermarket trade is one of the most concentrated in the world. Concentration in any market brings the risk those with the upper hand may misuse their position. Witness events across the Tasman where the supermarket trade is also dominated by two main players. The Australian Competition and Consumer Commission (ACCC) is investigating allegations that Coles and Woolworths (owner of the Countdown chain here) have misused their market power and engaged in "unconscionable conduct" in dealings with suppliers. ACCC chair Rod Sims told a Senate committee in February 2013 the allegations included persistent demands for extra payments from suppliers, threats to remove products from shelves if payments weren't made, failure to pay agreed prices, and conduct that discriminated in favour of the supermarkets' own private-label brands. The commission has now resorted to using its compulsory information powers to extract more information about what’s going on in the industry. Grumblings from suppliers about the tactics used by the big chains here occasionally surface. Horticulture New Zealand, which represents around 5500 fruit and vegetable growers, has previously called for an investigation into the retail pricing of fresh produce. It’s claimed mark-ups are “extreme” in some cases. But confidentiality agreements between supermarkets and their suppliers continue to cloak much of the trade in secrecy and make any claims hard to prove. As Australia's regulator has found, suppliers are reluctant to come forward unless there's a guarantee of anonymity. Amidst the secrecy, at least one visible cause for complaint has been the promotion of private labels – the supermarkets' own house brands. It's estimated private labels make up around 14 percent of the two chains’ business and their share is forecast to rise. Goodman Fielder, hardly a minnow in the game, blamed pressure from private labels as one of the reasons for its drop in revenue last year. Private labels used to be the no-frills option – low-priced plain-packaged versions of basic foods. But that's changed as the supermarkets have looked to improve their margins. Private labels have shrugged off their budget look and can now be found sitting beside mainstream brands. You may have to look twice to see what you’re buying. Countdown's private labels extend from its basic Homebrand to its new Macro Wholefoods Market, targeted at "families and health conscious shoppers". The store has more than 2400 private-label products out of around 39,000. Parent company Woolworths has previously announced plans to double private label sales. Foodstuffs has around 3000 private-label offerings. Most are marketed as Pams; the remainder under the Budget label. Where they're cheaper, private-label products can offer consumers savings. But the flipside is there may be less choice if other brands and their manufacturers get squeezed out. Long term, there's also a risk the squeeze may force up prices if supply is reduced. The Australian consumer organisation Choice reported the case of one supplier who had his organic product cut after Woolworths launched its Macro Wholefoods range. Choice said Woolworths' category buyer told the supplier there was only room for one brand – its own. Private-labels haven't reached the heady heights seen in other countries. According to a 2011 report by market-research company Nielsen, private labels command a 43 percent market share in the UK. The figure hovers between 20 and 30 percent in Europe. 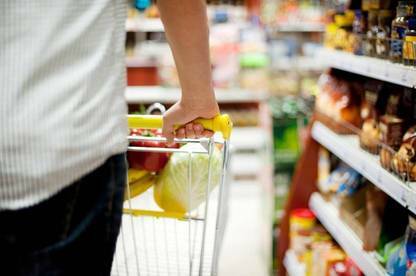 One in every four products sold in Australian supermarkets is estimated to be a private label. The term ROB+1 – short for retailer's own brand plus one other brand – has been coined to describe the private label spread. A report on the market by Rabobank concluded ROB+1 is already common practice in "mature product categories". Private labels make obvious economic sense for the supermarkets. But the private-label push is being flagged as another sign of increasing concentration in the supermarket trade and is among the factors prompting some regulators to take a harder look at the industry. A major focus of the ACCC’s investigation in Australia is whether the big chains have misused their market power to discriminate in favour of their own brands. The ACCC is also signalling support for a legally enforceable code of practice to redress the "imbalance of bargaining power" in the industry. Faced with the threat of government intervention, industry players (including the supermarkets) are attempting to thrash out a voluntary code. An early version of this code is reported to have proposed a 30 percent cap on private labels but the idea appears to have been dropped. In the UK, where four big supermarkets dominate, there’s already a code of practice and a "supermarket ombudsman" was appointed in 2013. The ombudsman will adjudicate on complaints from suppliers about supermarket practices that may be an abuse of buying power. But even in the event of a complaint alleging unfair practices, the commission may find it has limited powers to act. Unlike Australia's regulator, it has no powers to investigate allegations of "unconscionable conduct". It can act where there's evidence of misuse of market power but the bar to trigger an investigation is high. The legal line between misuse of power and driving a hard bargain is also blurry. By their own admission, supermarkets’ sheer size and scale gets them better terms from suppliers. In a submission to a parliamentary select committee in 2011, Foodstuffs stated these terms could include discounts for bulk-buying, discounts for transporting the goods, and various discounts for advertising and product promotion. There are calls for regulation to rein in supermarket power. Green MP Mojo Mathers is re-working a private member’s bill (originally developed by former MP Sue Kedgley) that proposes arrangements similar to the UK’s. Unsurprisingly, the National Association of Retail Grocers and Supermarkets of New Zealand – which represents owner-operated supermarkets including New World and Pak'nSave stores – believes regulation isn't needed. Executive director Trina Snow argues that the industry is responsible and doesn't need any "red tape". But the idea has won the backing of Horticulture New Zealand. Chief executive Peter Silcock says the organisation supports further investigation of where costs fall in the supply chain and believes a code of practice may help shed light on the matter. The New Zealand Food and Grocery Council – which represents manufacturers and suppliers – is "keeping an open mind". The council’s Katherine Rich says it’s able to raise issues on behalf of member companies directly with the supermarkets and gets “good results”. Rich says the council has been tracking developments in Australia and the UK. It's not championing a mandatory code of practice here but says that "might be something to consider if relationships between grocery retailers and suppliers broke down". Overseas experience indicates the risk of bad behaviour is likely to increase as the fight for market share intensifies. Progressive Enterprises has recently renewed a campaign to win a bigger slice of the pie. Our latest price survey shows it's mounting a stiff challenge. Our supermarket trade is one of the most concentrated in the world, with two big chains dominating the market. Concentration in any market has inevitable risks for suppliers and consumers. Given the gaps in legislation, a code of practice for the industry could be worth exploring. But any code would need to be backed up by an independent arbiter with the power to investigate unfair practices. Private-label products can provide manufacturing opportunities for local companies but a sizable chunk of these goods come from offshore. Countdown says 60 percent of its private-label products are imported. Parent company Woolworths’ half yearly report also points to "direct global sourcing" as a key factor in the gross margin gains made by the chain this year. "Globally sourced" products at Countdown include Select Corn Creamed Kernels made in Thailand, Select Pear made in South Africa and Select Peach Treats made in Swaziland. Countdown says most of its private-label revenue (70 percent) still comes from locally-sourced goods such as milk and cheese. Foodstuffs told us around 25 percent of its private-label goods were sourced overseas. Among them are Budget Milk Arrowroot Biscuits and Pams Sliced Apple made in China, and Pams Tissues made in Malaysia. Foodstuffs Wellington announced in its 2012 annual report that it was setting up a "global buying office" in China to “source leading products and maximise in-store margins". The chain says it favours sourcing from local suppliers "wherever commercially possible" and has “no particular desire or aspirations to grow private labels at the expense of our branded suppliers”. Both the big chains told us they source overseas as there may be limited or no local supply of some products. Progressive Enterprises was warned in 2012 for advertising beer "at least 20 percent off" and "at least 25 percent off" the standard shelf price. The Commerce Commission found the claimed discount was misleading because, in a number of cases, the beer hadn't been sold at the standard price for months. But the company got off with a warning partly because the commission said it appeared this type of practice was "fairly widespread in the retail sector". According to a recent Nielsen survey, 59 percent of groceries were purchased on "promotion" last year. As a result of further misleading-pricing complaints, the commission says it’s been working with both Progressive and Foodstuffs, and the two chains have taken “steps to strengthen procedures to ensure compliance with the Fair Trading Act”. The commission says it’s monitoring compliance and "will take appropriate action where necessary". Advertising is a big ticket item for both stores. Foodstuffs claimed the number one spot in Nielsen’s list of top 10 advertisers in both 2009 and 2010. It finally slipped to number two in 2011 after rival Progressive Enterprises ramped up its advertising spend to over $70 million. Foodstuffs was back on top in 2012.